BB Andrews accepts the Pride of Safford Award. 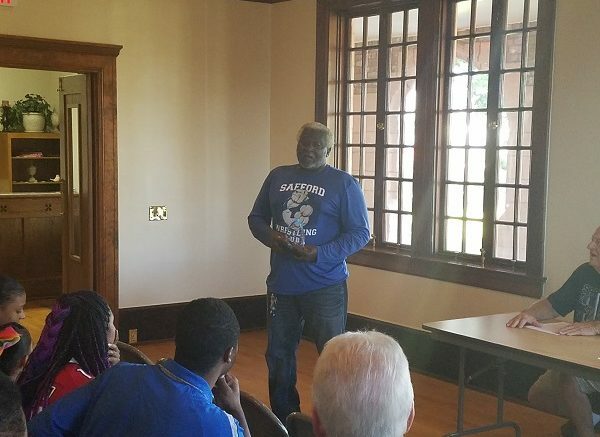 Today the Pride of Safford Award Committee honored longtime Safford educator and coach, Herman “BB” Andrews with the Pride of Safford Award. This award is the most prestigious award that is handed out by this City of Safford. The award was created in 1994 to honor those that make Safford a great place to live, work and visit. Anyone that has been associated with Gila Valley athletics for the last 46 years has heard of or knows BB Andrews. He excelled in 3 sports in high school before playing at EAC and then Grand Canyon. He held the single game basketball scoring for many years at Safford before Matt Barney broke it. Still coaching and teaching at Safford, BB has assisted in football, basketball and wrestling. In addition, he has coached both boys and girls track for 20 plus years. His teams have excelled on the track under his tutelage. The boys have won 20 Regional Championships and the girls have won 16. His boys teams have won 11 State Championships and the girls have won the championship 15 times. BB Andrews has been recognized by his peers numerous times in his coaching career. He has been named Arizona Track Coach of the Year 7 times. He was also named the AIA Track Coach of the 20th Century. In 2004 he was inducted into the Arizona Coaches Hall of Fame and named National High School Federation Track Coach of the Year. In June of this year was inducted into the National Coaches Hall of Fame. Andrews thanked the standing room only crowd who showed up at the Annex Building to honor him. He told a story of how 4 Safford educators put their jobs on the line to vouch for him as he was applying for the job. “I have been trying for 46 to make them proud and thank them for what they did,” said Andrews. I think he’s done a fine job of making them proud.